The weather hasn't been very pleasant recently. It has been snowing and the snow has stayed for a few days. While some adults and students were hurrying to get somewhere indoors, other, less stressed, people were enjoying the snow. They were sliding on it, playing with snowballs and making snowmen. 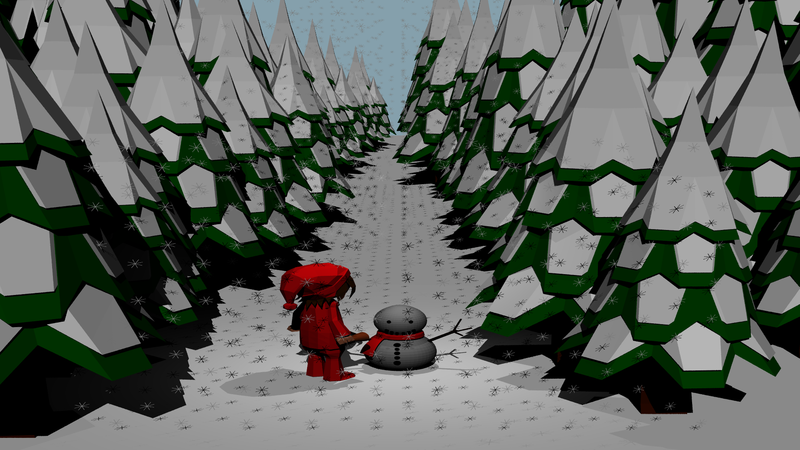 That's why I decided to represent a little girl making a snowman in my scene. Looking at this scene reminds me that sometimes we should just stop, look around and try to see the surrounding environment in a different, carefree, way - namely, to enjoy the little things. This scene was built in Blender. A set of preexisting models were used. At the bottom of the page you can find all models that were used to create the scene. The renderer was developed during the assignments. Directional light was used to lit all the objects in the scene. Spot light is used to lit the “focus” of the image – the girl and the snowman. The entire scene is rendered with 10 samples, using a computer with Intel core i5. It takes about 30 minutes.